Shipping your products accurately and on time is our highest priority. We realize that we are the last people to see your product before it goes to your customer. 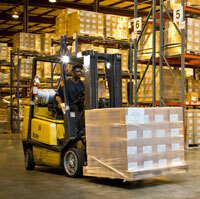 Material handling and distribution is what we do! We know that it needs to be perfect: the right product, the right quantity, shipped on time, shipped with no damage, and with accurate paperwork. With almost 70 years of experience, we have the knowledge and commitment to accurately handle your most challenging logistics requirements. Our seamless communications allow you to place orders, track your shipments, and monitor your inventory. Whatever your supply chain needs, we can create a successful solution that will make your customers smile!